The workhouse here was erected 1725, by a Subscription of the parishioners, begun by the two Members of Parliament, that then served for the City of Rochester, who subscribed one hundred Pounds each, and the whole Subscriptions, amounting to 727l. 14s. was laid out in building a very commodious House, on a Piece of Ground purchased for that purpose, opposite to some Alms-houses, which now serve for a kind of Infirmary to the Workhouse, and what was wanting to finish and furnish the New House with Necessaries, amounting in the whole to about 1300l. was paid for out of the Assessments of the Poor. Before the Workhouse was opened, the Expence of supporting the Poor at a Medium for 7 years cost 945l. per Annum, but now, as appears by the 2 last Years Accounts 574l. per Annum has sufficed, including all accidental Charges, tho' the number of Persons wholly maintained in the House, at a Medium for 6 Years past, have been 73. These are, for the most part, employed in picking of Ockam for his Majesty's yard, at which they earn about 25l. per Annum. They spin Wool and Flax for the Woollen and Linen wore in the House, and all the Poor do something according to their Strength: They dress their own Flour, make their Bread, and cook all the Victuals for themselves. They wash and clean themselves and the Children, who are obliged to go to School every Forenoon, to learn to read and say their catechism; but in the Afternoon they spin, the Girls sew, under the Care of a Mistress, who is one of the House; and the rest not otherwise employ'd, pick Ockam with the old People; at the Age of 11 or 12, the Boys are bound out to Fishermen, House-Carpenters, Blacksmiths, and other laborious Trades; and the Girls are put into Service. In this City there are two Workhouses, one in the Parish of St. Margaret, and the other in St. Nicholas's Parish; the House in the former Parish was erected 1724, towards which our two Representatives in parliament contributed 100l. each, and the Parish borrowed 100l. more upon Interest, to compleat the Design. There are 12 Governors chosen Annually for the Management of it, of which the two Churchwardens and two Overseers of the Poor, are always of the Number; two Governors in their Turns, take Care weekly to visit the Workhouse every Day, to see good Orders, and inspect into the affairs of the House: and the first Sunday of every Month, as many of the Governors as can meet at the House, to give Directions, if there be occasion, for cloathing, &c.
The Governors buy the Provisions &c. at the cheapest price. 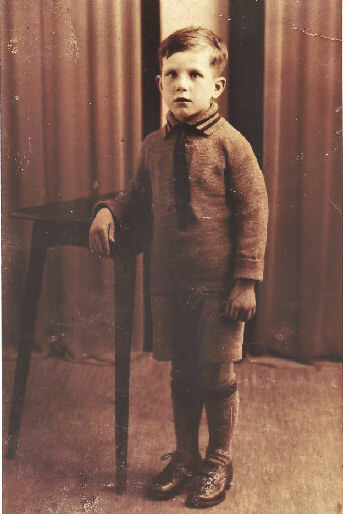 There are between 25 and 30 Persons generally in the House, ten of which, are at this time Children, who are taught to read, beside Carding and Spinning Wool, and when old enough, are put out to Apprenticeships. 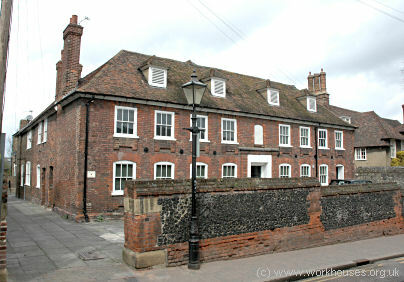 The Workhouse of the Parish of St. Nicholas, is upon the same Footing as St. Margaret's. A Parliamentary report of 1776-7 recorded parish workhouses in Chatham (for up to 250 inmates), Rochester St. Margaret (70), Rochester St. Nicholas (90), and Gillingham (60). St. Margaret's Parish Workhouse in St Margaret's Street remained in use until 1859 after which the premises were converted for use as St. Margaret's National School for Girls. The building still stands and is now owned and used by the King's School, Rochester. 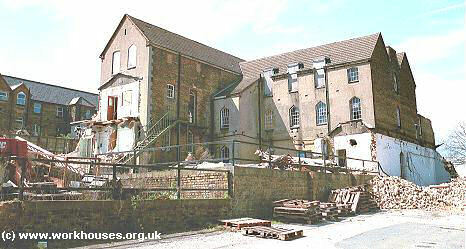 Rochester St Margaret1 workhouse, 2005. County of Kent: Chatham (4), Gillingham (3), Grange, Lidsing, Rochester Cathedral Precincts, Rochester St Margaret's (2), Rochester St Nicholas (2). The population falling within the Union at the 1831 census had been 33,068 with parishes ranging in size from from Lidsing (population 51) to Chatham (17,936). The average annual poor-rate expenditure for the period 1833-5 had been £12,646 or 7s.7d. per head of the population. 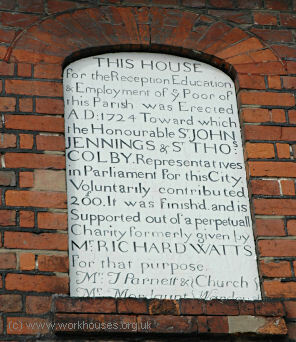 Initially, the new Medway Union took over the existing parish workhouse buildings in Chatham and Rochester St Nicholas, for which the Poor Law Commissioners authorised an expenditure of £3,960. In 1843, the Guardians discussed extending the Chatham workhouse with the purchase of adjacent premises on the High Street. However, the Poor Law Commissioners suggested that a totally new building be erected instead. In 1856, plans were finally set in motion to build a new workhouse at the west side of Magpie Hall Lane in Chatham. The land was purchased at £15 an acre from Mr Benjamin Mannering. A competition for the design of the new building was won by Frederick Peck and Edward Stephens of Birmingham under the pseudonym of "Invicta". Their original plans were subsequently modified to reduce the costs of the scheme. Their revised plans were intended to accommodate a total of 650 inmates, including a hospital, at a cost of £11,900. Construction work began on 23rd March 1858. Water for the new building was intended to be manually pumped from a well but a steam pump was later included in the plans. 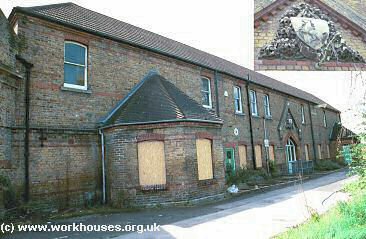 The new workhouse opened in November 1859 and the old buildings at Chatham and Rochester were sold off. 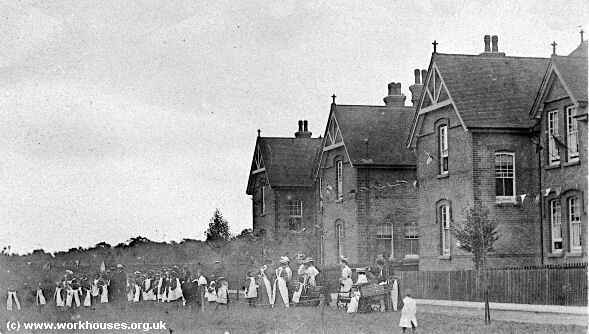 At its opening, the new workhouse comprised: entrance buildings and open shed; vagrants' and receiving ward; main building of men's and women's wards and infants; the Master and Mistress's apartment; the boilers and cooling apparatus; bread and meal areas; workshop, drying room and laundry; hospital, idiots' ward, itch ward, fever and smallpox wards; well house and engine; furniture and bedding store. The workhouse location and layout are shown on the 1896 OS map. The new workhouse had an entrance block at the east, to the rear of which were a receiving block and a vagrants' block. Medway entrance block from the south-east, 2001. The T-shaped main workhouse building was three storeys high. The kitchens and dining hall lay at its rear. Medway south wing of main building from the south-east, 2001. To the west of the main block lay the original infirmary which was two storeys high. 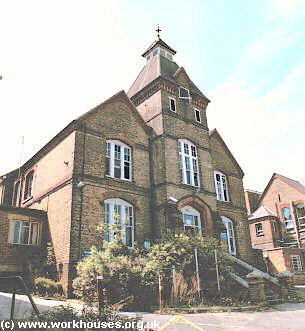 Medway original infirmary block from the south-west, 2001. In 1884, a new infirmary block and infirmary administrative block were erected at the west of the site. Medway 1884 infirmary administrative block from the south-east, 2001. A three-storey T-shaped blocked was later added between the dining hall and original infirmary. Medway T-shaped block from the south-east, 2001. A chapel stood at the north of the workhouse. 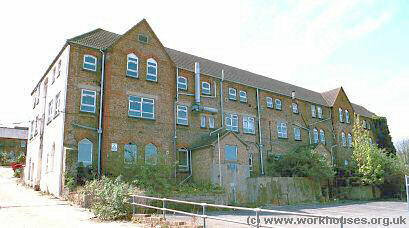 In 1932, the former Medway Union workhouse was renamed Medway Hospital, then in 1936 it became County Hospital. In 1948, following its absorption into the National Health Service, it became All Saints hospital until its closure in 1999. The site has recently been redeveloped and many of the original buildings demolished. In August 1903, the Medway Guardians opened a children's cottage homes site on Pattens Lane at the south-west of Chatham. The development was arranged around the perimeter of a square and included four pairs of boys' homes and four pairs of girls' homes together with a school. The location and layout of the site are shown on the 1910 map below. Medway cottage homes annual sports day, 1907. Medway cottage homes annual sports day (detail). 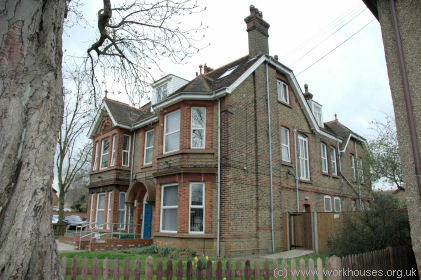 The homes were extended in around 1912 and then comprised 16 semi-detached cottages, 8 for boys and 8 for girls, together with receiving wards, schools, workshops, and a staff house. Medway cottage homes school from the north-east, 2005. The Headmaster of the school was a Mr. Hawes. The Matron of the Cottage Homes in 1933, I cannot remember her name but in 1937 or 1938 a new Matron took over - her name was Mrs. Mercer. Her husband was the Superintendant they had two children Brian and Judith Mercer. What a relief when the new Matron, Mrs. Mercer took over. She forbade the hitting of children, gone was the corporal punishment. No more six of the best on the bare backside. No more cold water baths or washing the mouth with carbolic soap and a toothbrush. The putting of an offender in the small gas cupboard under the stairs,and keeping the child locked up all night was forbidden The old straw mattresses were changed to new modern mattresses in fact the new Matron was for us kids an Angel. In 1938, a radio was installed in the Matron's cottage and in each of the children's cottages a box appeared on the dining room wall. Can you imagine our surprise when we first heard the BBC's children's hour. There was a let up in discipline the 'no talking' during meals was not enforced anymore The homes as we kids called it would have been heaven for us kids if we had had the New Matron much earlier. I myself thanked God when the war broke out and we were evacuated to Whitstable and then to South Wales. Free at last from the clutches of the Kent County Council. Bernard Shaw at Medway cottage homes, 1930s. The homes have now been demolished with the exception of the school block which is used by the local social services. Cottage Homes 1913 — Superintendent: Sidney John Hawley; Matron: Mrs Rosina Hawley; Schoolmaster: James A Price; Schoolmistress: Mrs Lily Hawes. Medway Archives Centre, 32 Bryant Road, Strood ME2 3EP. Holdings include: Guardians' minutes (1835-1930); Admissions and discharges (1867-1931); Births (1878-1914); Deaths (1877-1930); Creed registers (1878-84, 1901-32); Deaths (1877-1914, 1922-30); Punishment books (1878-1913); etc. Ancestry currently has: Admissions and discharges (1867-1930); Births (1878-1914); Deaths (1877-1930); Creed registers (1878-1884, 1901-30); Deaths (1877-1914, 1922-30); Lunatics register (1889-1906); Cottage homes relief lists (1903-1929). Jason Ross's Historic Medway site.